You might have missed it. Tarzan 2 was a 2005 direct-to-video Disney movie. It's not actually a sequel to Tarzan; it's more of a in-the-middle-of-the-first-movie-quel. The whole story takes place during one of the first film's songs. Don't be scared away by the direct-to-video tag, though; this movie is an interesting portrayal of Tarzan's journey towards identity formation, which is an important issue in any adoption. Tarzan 2 isn't a perfect movie as far as adoption issues go, but overall, it's worth a read and a watch. My adoption review of the first Disney Tarzan movie would be a helpful read before going on to the sequel. Tarzan is a young human boy living with a family of gorillas. Although he is accepted by other children in the family and deeply loved by his mother Kala, some of the other adults in the family do not feel he fits in. He can’t keep up with the others, and the group has to wait for him when racing towards shelter from a storm. Tarzan confides to his mother that he feels he is “not a good ape,” and that he believes “everyone would be better off if I just wasn’t around.” Tarzan’s mother tells him that he and the family need each other, and that she particularly needs him. However, an accident occurs where Tarzan is presumed dead. He overhears various family members expressing their belief that Kala (and the rest of the family) will be better off without him. Tarzan decides to run away, even though running away might expose him to a fearful monster named Zugor. 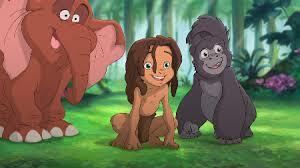 Meanwhile, Tarzan’s friends and mother have discovered that he is still alive, and set out to find him. They find themselves in danger, but Tarzan, inspired by knowing that he is uniquely himself, is able to rescue them. As the film ends, Tarzan is happily reunited with his gorilla family and is able to fit in – not as another gorilla, but as a Tarzan. Tarzan is a human who is being raised by gorillas. The movie shows him struggling to be “a good ape,” and eventually working to discover his own identity. He withdraws for a time during a difficult period of this work. He finally realizes that he is both “a Tarzan” and a member of his gorilla family. Adoptees who are adopted cross-culturally likely have a similar quest: to synthesize their multiple identities. Their quest can be impacted by others. 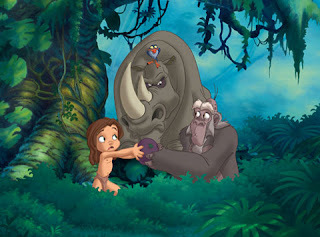 The impact can be positive, like when Tarzan’s mother tells him that she needs him and that he needs the family; and when Zugor tells Tarzan that Tarzan is uniquely himself. The impact can also be negative, like when the displaced apes laugh and tell Tarzan that he obviously isn’t one of them; and when some of the gorillas in Tarzan’s family express their belief that the family is better off without him. It is ultimately the adoptee’s job to determine his or her unique identity, but the role of the adopting family (and the birth family) should be to show unconditional love for the adoptee and to allow the adoptee freedom to do this work of identity development, rather than making the adoptee feel guilty for having an identity with multiple sources. Tarzan’s mother affirms her love for Tarzan to him and to others. She affirms to him that he needs the family and that the family needs him. At the very end of the movie, Tarzan realizes that part of his identity is being part of his family. Tarzan left because he felt everyone would be better off without him; however, in his absence we see that he is very much missed by his friends and his mother. Tarzan ran away, in part, because some adults in his family expressed that the family would be better off without him. This was largely due to Tarzan being less physically capable than the rest of the family. When Tarzan returns, his newly found confidence has seemingly increased his physical capabilities , but the adults never recant their statement that the family would be better off without Tarzan. This is challenging for two reasons. First , many children who are adopted have experienced abuse or neglect, which sometimes results in physical, mental, emotional, educational, or developmental delays. Children who already feel sensitive about their delays may resonate painfully strongly with Tarzan’s inability to keep up with his peers. These children might also take an unintended lesson from this movie: they’ll fit in once they function as well as everyone else. Parents should use discretion in determining whether this is an appropriate movie for their children. Parents may want to watch it before showing it to their children. A second concern is that, while Tarzan accepts the family as his own, we never learn whether the whole family accepts Tarzan. This may mirror the situation in some families; it’s possible that some extended family members of some families don’t fully accept an adoptee as part of the family. If this happens, the best course of action for a parent may be to continually affirm the adoptee’s worth and place in the family – both to the adoptee and to the unaccepting family member. If the family member persists in their lack of acceptance, contact should probably be limited. Tarzan’s family appears to be very closely-knit, and so Kala would likely have to confront her other family members about what they say about Tarzan. We never see those conversations in this movie. As a musical, animated Disney movie, this film will probably appeal most to children up to about ten years of age. Identity formation is a relevant topic of discussion for kids towards the later end of this age group. The movie’s main message is supportive of a person’s individuality and their inclusion in a family; this is good for adoptees, and particularly cross-cultural adoptees. There are some concerns with some members of Tarzan’s family never expressing their acceptance of him , but this movie could still be helpful as a starting point for some discussion in support of adoptees being comfortable with the identity that they inherit from their birth family, the identity that they receive from their adoptive family, and the identity that they creae for themselves. Tarzan wondered who he is. Who do you think Tarzan is? Some adults said mean things that hurt Tarzan’s feelings. The things they said were not true, but they still hurt. Has anyone said something that hurt your feelings? Are there members of your family or friends who are not (or will not be) supportive of your adoptee? Who are they, how do they express their lack of support, and how can you respond to them? If you have adopted cross-culturally (or are considering doing so), are you comfortable with your adoptee forming an identity separate from your own? How will you help in this? What can you do to create a “new” family culture that incorporates elements of everyone’s culture? What are your expectations and what are your hopes about how your adoptee will choose to identify in the future? How will you help your child develop as an individual?